The first part of this essay argues that the “abyssal” cartographies delimiting the Old World and the New World in the colonial era live on structurally in modern western thought and remain as constitutive elements in excluding political and cultural relations retained in the contemporary world system. Global social injustice would thus be closely related to global cognitive injustice, so that the struggle for global social justice calls for the construction of “post-abyssal” thinking, whose principles are presented in the second half of the essay as programmatic premises for an “ecology of knowledges”. 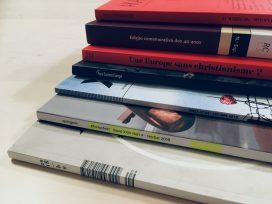 This article presents the theoretical points of departure of an ongoing research project whose goal is a PhD dissertation on “the absence of Portuguese music in the European context”. Taking as its starting point a central element, the absence of Portuguese music from the European classical music canon, an endeavour is made to analyse the historical processes which have led to this non-existence and its prevalence throughout the whole of the twentieth century. The article debates some of the issues which must be addressed when studying the universe of music as an object of sociological analysis: first, possible demarcations of the object are set out; then, the issue of music is equated as an object and purveyor of meaning; lastly, a line of questioning is addressed to the socio-cultural universes of musicians. This article examines the overall strands of an analysis model for experiences of unemployment, with special focus given to one of its cornerstones: compensation mediators. Within the framework of compensation mediation, an analysis is undertaken of the role played by the social state in organising strategies for adjusting to the withdrawal of employment on the part of those made unemployed after a Coimbra ceramics factory, Estaco, shut down in 2001. The pivotal position of the social state allows us to put middle-aged unemployment into perspective as an event which compromises individuals’ ability to ensure their financial autonomy and which magnifies the social state’s function. This text analyses lay people’s forms of knowledge and rationalities which frame self-medication practices. After a brief critical review of the main theoretical peaks of the analysis of lay knowledge vis-à-vis expert knowledge, the aim is to demonstrate current forms of lay appropriation and reconversion of expert knowledge and the modalities of expertisation which such lay knowledge uncover. In contradistinction to the sociological potentiality contained within these forms with a view to developing new spaces for lay people’s autonomy, a discussion is developed on the new forms of lay dependence with regard to expertisation by means of the thematics of self-medication and of a typology of modalities of lay cognitive construction made up of spontaneous forms of knowledge, mediated knowledge and confirmed knowledge. 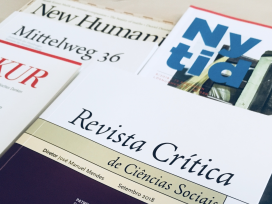 The constructed nature of these forms of knowledge, which are not merely mimesised as a result of contact with expert sources, leaves open the need for a new epistemologic dialogue among the different theoretical currents which address reflexivity in modern societies. The problematics of social identities has been one of the main strands explored in Soviet and post-Soviet studies, above all after the 1990s. These studies have contributed to deepen an understanding of the Soviet Revolution, at the same time allowing for articulation within the centrality of identity issues in the current historical setting. Taking up the spirit of such studies, but also that of research in Portugal which has endeavoured to develop an overall anthropology of identity processes, this article sets out to re-analyse the evolution of Lenin’s thought and of that of the Bolshevist regime, in the light of Russia’s ambivalent identity stance between Asia and Europe, between East and West. To this end, the concept of “border identity” is applied to clarify the oscillations which characterise the strategic choices made by Russian communists in the geopolitical realm.